Today a group of volunteer students from my POLI 450 (Peacebuilding) course at McGill University helped me playtest the Afghan Provincial Reconstruction game produced by LEC Management. The game was designed by Roger Mason (LECMgt) and Joe Miranda, with input from Eric Patterson at the Berkley Center for Religion, Peace, and World Affairs at Georgetown University and COL Eric Wester at National Defense University. 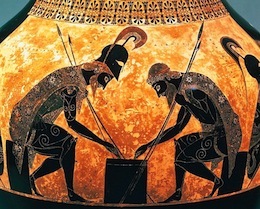 A full description of the game by Mason and Patterson will be appearing in a forthcoming issue of Simulation and Gaming, but the basics are fairly straightforward. 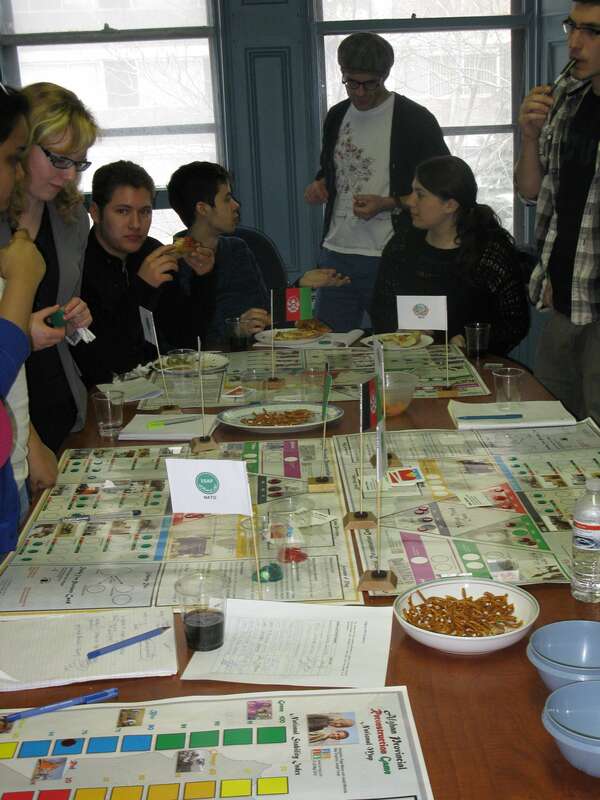 The 12 players each in the game belong to three different groups: the Government of the Islamic Republic of Afghanistan (GIRA), NATO, and the fictional “World Church Union.” While the WCU is meant to represent faith-based humanitarian NGOs—the game originally grew out of a symposium on religion and military affairs—in practice they pretty much function in the game as a generic NGO or collection of NGOs. The game is played in front of four display maps. Three of these represent Afghan provinces, while one represents the national situation. One player each from GIRA, NATO, and the WCU sit at the national map, receiving resources at the start of each turn and allocating these and other assets to their counterparts in the provinces. Each provincial map, in turn, will also have a player each from the GIRA, NATO, and the WCU. The players utilize the resources the receive to try to complete various development projects. 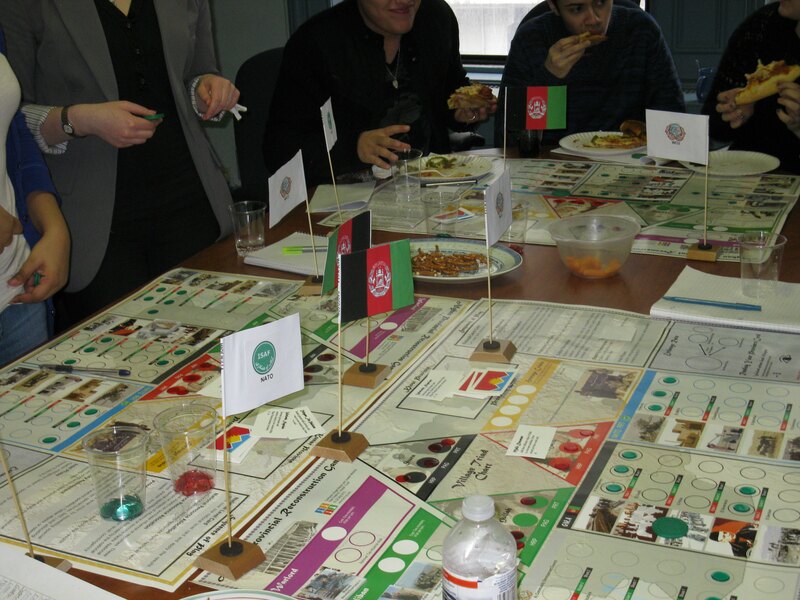 The objective of the game is to stabilize Afghanistan by gaining influence and completing projects. If Afghanistan’s “National Stability Index” rises above a certain point, everyone wins. However, group players can also win if their group completes all their assigned projects (for example, all WCU projects are completed), while provincial players can win if all GIRA, NATO, and WCU projects in a particular province are completed. Sound simple? Well, there are complications. The allocation of resources by the national players to the provinces can be the subject of considerable bargaining, especially as players try to allocate scarce resources in ways that create synergies and optimize effects. The provincial players need to build influence with local powerbrokers before projects can go ahead—in the game this is represented by a triad of a local government official (malik), a local religious leader (mullah), and a local council of elders (shura). There are random event cards at both the national and provincial level that can create all manner of complications for the various players’ plans, ranging from suicide bombings to religious backlash to cholera outbreaks. The Taliban and hostile warlords make an appearance, damaging reconstruction efforts. al-Qa’ida might even take hostages. The various bad guys can be dealt with, but that usually requires a combination of local influence and military assets provided by the national-level decision-makers. Of course there are never enough resources to go around. Intelligence matters too, sometimes giving players an opportunity to look ahead to the next event, and prepare accordingly. As is evident from the summary, the Afghan Provincial Reconstruction game is not meant to be a detailed simulation of actual Afghan combat and development operations. Indeed the province “maps” aren’t really maps at all, but rather identical displays with different names on them. The possible random events and game dynamics and project costs are the same for each province too. Anthropologists could endlessly quibble about the abstract model of local power dynamics. However, this isn’t what the game is about. Rather, it is trying to capture some of the difficulties of stabilization and development efforts in nonpermissive environments, with a particular focus on the challenges of resource allocation and coordination. So how does it fare in this? Judging from student reaction, it was a considerable success. Resource allocation discussions soon became noisy, even heated. In some provinces actors worked together well, while in others there was a little more tension and a little less sharing of information and resources. Successful programs were rapidly undone by adverse events, and the tension was quite palpable when it came time to flip the event cards each turn. In one notable case, some miscommunication resulted in a failed SAS hostage rescue mission in Khost, creating a crisis of confidence among local power-brokers. In Kandahar, an aid convoy was ambushed. All manner of things complicated the lives of the Kunar provincial team, with the increasingly stressed NATO official there suffering from what seemed to be a simulation-induced case of PTSD. In the end, however, the players manage to achieve an impressive “Total Victory,” pushing the National Stabilization Index up over 100 for two successive turns. Hurrah! Whether this was due to innate skill, good luck, the insights generated by my POLI 450 lectures, or the security-and-development facilitating powers of Angela’s Pizza we were unable to determine. Although the facilitator manual suggests that a game can be played in two hours, ours ran significantly longer than this even though we didn’t need to play through the full eight turns. This included some time for briefing the rules at the outset, however, as well as pizza distribution. I’m not sure I would have wanted to hurry it along any faster, however, since the player discussion and strategizing were the most important part of the process. We also ran into a few cases where the rules seemed unclear, or where the rules seem to say one thing but the event cards suggested another. This was quickly resolved by divine intervention, however. Finally, the game also generated a number of ideas for tweaks and add-ons. Far from being a weakness, I view this very much as a strength: unlike a digital game, a “cardboard” boardgame is easily modified. Next year, therefore, we are likely to roll out our own version 2.0 with an active Taliban player, rather than having all opposition activity generated by the event cards. Doing this will allow us to explore adaptive-counteradaptive cycle of insurgency and counter-insurgency. It will also generate even more tension into the classroom setting, thereby further encouraging student engagement. I’ve invited student participants to add comments below, which some may choose to do. I certainly would like to thank them for all participating—I was impressed at the turn-out on a slushy, wet Saturday morning! Thanks are due as well to my co-facilitator Tommy Fisher, who took a break from designing anti-corruption and financial intelligence simulations (and surviving our gaming group’s ongoing zombie apocalypse) to help us out. For further information on the game, contact LECMgt at info@lecmgt.com.